A new pop up café is to open its doors on 25 February aimed at developing awareness among young women of the role that Irish Sisters play in society. 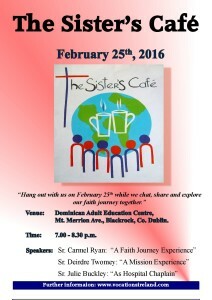 ‘The Sister’s Café’ is being run in conjunction with Vocations Ireland. It hopes to open up conversations between Irish nuns and women between 20 and 35 who may be interested in learning more about spirituality and the role that Sisters play in modern day Irish communities. Congregations from eight female religious orders including the Medical Missionaries of Mary, Franciscan Missionaries of Divine Motherhood, the Dominicans, Salesians, Daughters of Charity, Marie Reparatrice Sisters, and St Joseph of Cluny Sisters will be there to meet, greet and share conversation. There will also be the opportunity to learn more about vocations and the meaningful role that a Sister can play in assisting the more vulnerable in society. The Sister Café opens on the evening of 25 February in the Dominican Adult Education Centre, Merrion Avenue in Blackrock, Co Dublin.